Gravlax is a dish that never fails to impress and surprisingly easy to make at home. It’s also a really nice way to include more wild seafood in your diet. Gravlax is a Scandinavian dish. In the most basic terms, it’s raw salmon that is cured in a salt and sugar brine mixture. That brine is infused with fresh dill — a key characteristic unique to this dish — and sometimes other seasoning and spices. The fish is not cooked, but cured, which means that a combination of salt and sugar draws out moisture from the fish, changing the texture of the flesh and allowing the flavors to be absorbed into the fish. Gravlax is often confused with smoked salmon or lox, and while all of these dishes are similar in that they are made using raw salmon, they are actually all unique in various ways. Gravlax, as we said, is made by curing fresh, raw salmon in a specific brine that is a combination of sugar, salt and a whole lot of fresh dill. Lox is derived from the Yiddish word laks (aka salmon) and is made by curing raw salmon in a salt brine, without the sugar, other aromatics and herbs. Smoked salmon is different in that it is smoked rather than cured, and it can either be cold smoked (exposed to 80 degree smoke for a few days) or hot smoked (cooked through after being smoked with heat). So, How do You Make Gravlax? Create your brine mixture by combining salt, sugar, dill and any other aromatics or spices you want, based on your tastes. Many people add pepper or fennel and aquavit, Scandinavian distilled liquor, or a citrus zest for added flavor. Many chefs recommend an even ratio of 1/2 cup of salt and 1/2 cup a sugar. Generally speaking, it’s a matter of preference. If you are leaning towards a savory dish, then creating a salt-heavy brine will be more pleasing to your palate. If you prefer sweeter dishes, opt to bulk up a bit more on the sugar. There are a couple of methods to choose from. The simplest is to cover both sides of your fish filet with the brine mixture, and layer the fish in a deep dish with huge tufts of fresh dill. Another option is to cut your fish in two pieces and then cover each filet of wild salmon with the brine mixture on both the skin side and the flesh side. Layer the two pieces with the skin sides out and tufts of dill on the inside, so they are sandwiched together and then cover the dish with aluminum foil or plastic wrap. With both methods you need to put weight on top of the fish, either by placing cans or a plate or something heavy on top of the fish to weigh it down. This step is important because you’ll press more moisture out of the fish as it cures, allowing the fish to absorb more flavor. Let the dish cure for about 2-3 days, but for as long as 4 days if needed. You may want to turn the fish half way through the process and baste it with the brine liquid that collects every 12-14 hours, but it’s not necessary if the brine seems evenly distributed. Lastly, unwrap the fish, rinse off the brine, and slice using a very sharp knife in the way that you might slice a smoked fish, on an angle in very thin slices without the skin. Garnish with fresh dill and lemon slices. Gravlax pairs perfectly with bagels and cream cheese or pumpernickel bread and mustard sauce or even scrambled eggs. You can also serve it on buttered brioche bread as an appetizer or as a simple hors d’oeuvre at your next dinner party. *NOTE: Though the fish in gravlax is “cooked” by acid, it is still considered a raw form of seafood. 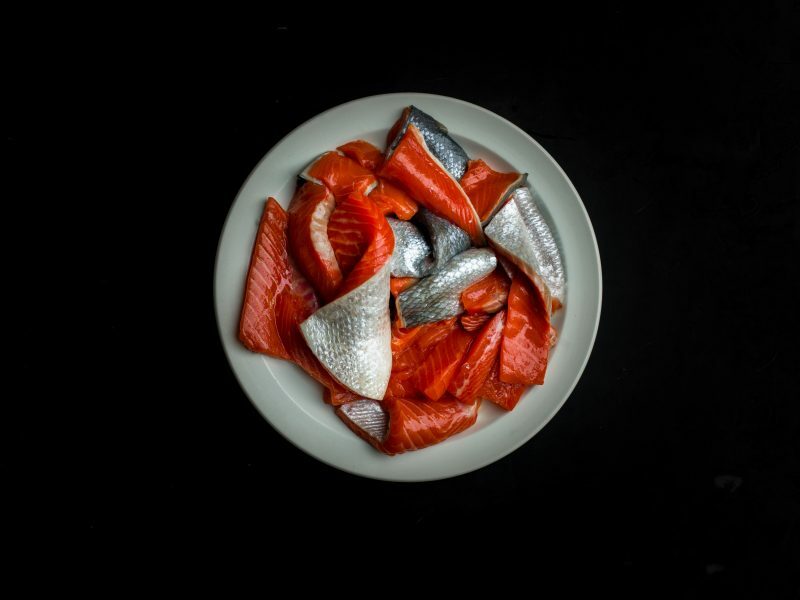 Officially, we cannot recommend that you eat our salmon raw; and are required to inform you that consuming raw or undercooked seafood and shellfish may increase your risk of foodborne illness. There's a physiological change that wild salmon experience when they move from fresh water to salt water (and back again), which makes them more susceptible to parasites found in fresh water. While we follow modern flash-freezing processes that help to kill off the parasites, we definitely recommend cooking our salmon before eating it. Here's an article with a few more details on our thoughts behind this.